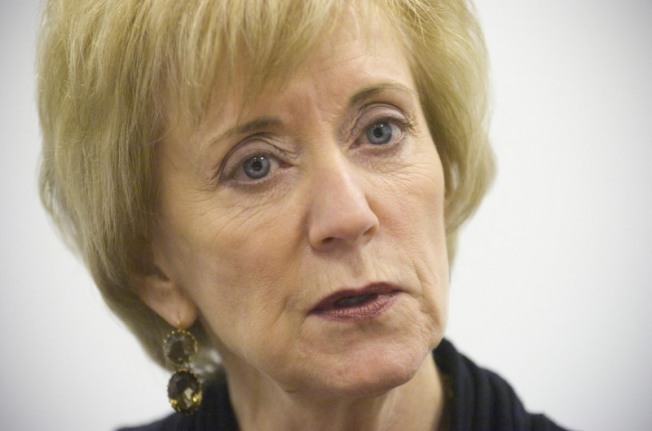 Linda McMahon, former CEO of World Wrestling Entertainment and current Republican candidate for U.S. Senate, during an interview at her campaign headquarters in Stamford, Conn. on Tuesday, Dec. 15, 2009. Linda McMahon has wrestled her way to the top of the Republican candidates for U.S. Senate, but Attorney General Richard Blumenthal is still the top vote-getter overall, according to a poll released on Wednesday. The former CEO of WWE came from being 10 points on the Republican side two months ago, bouncing back from the ropes to lead, 44 to 34 percent, over former U.S. Rep. Rob Simmons in the new Quinnipiac University poll – up from 37 to 27 percent in January. Quinnipiac University Poll Director Douglas Schwartz, PhD attributes the lead to money. "She is the only Senate candidate on TV right now. She quickly has become as well-known and well-liked among Republicans as the former frontrunner for the Republican nomination, three-term Congressman Rob Simmons," Schwartz said. The latest poll shows businessman Peter Schiff with 9 percent, while 12 percent of voters are undecided in who they would choose in the Republican primary. While McMahon’s numbers are up, Democrat Attorney General Richard Blumenthal is still the most popular of the candidates, although he has lost a few percentage points in the last couple months. "In the general election, however, Attorney General Richard Blumenthal has a commanding lead over all three potential Republican opponents. Blumenthal's approval rating continues near 80 percent. While money could make the difference in the Republican primary, it will have less of an effect in the general election. It is very hard to change the public's opinion of an elected official they have known and liked for 20 years." Of the Democrats, he has a strong lead, 81 to 6 percent, over Merrick Alpert. People surveyed chose Blumenthal, 61 to 28 percent, over McMahon, compared to 64 to 23 percent in January. He has a 62 to 26 percent lead over Simmons, compared to 62 to 27 percent and he leads Schiff, 64 to 21 percent. Quinnipiac asked about campaign spending and campaign donations and 46 percent of voters to 36 percent said they prefer candidates who rely on campaign donations, rather than a wealthy candidate who relies on his/her own funds.